And, again like most such lessons, it relies on the successful use of follow-up questioning to guide pupils’ understanding – to generate the sort of authentic dialogue in the classroom which develops real depth in pupils’ responses and thinking. 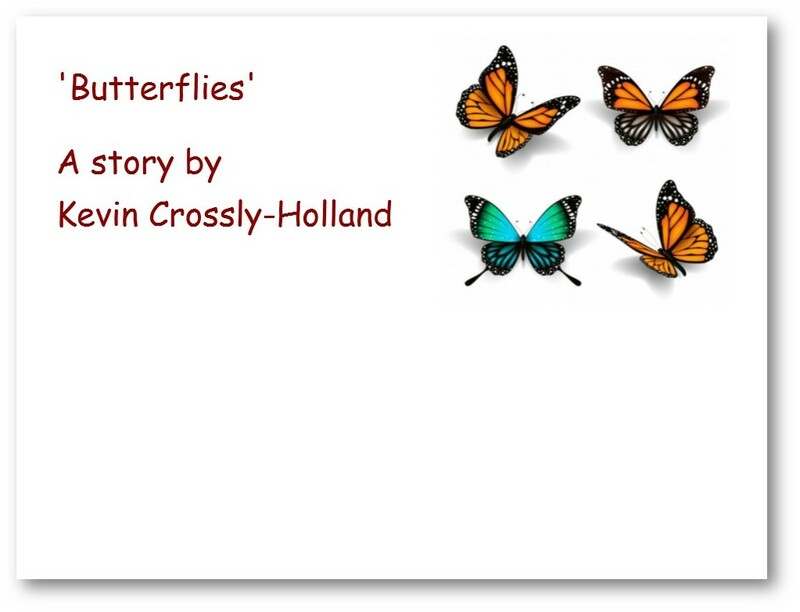 In the lesson, the class read a very short story by Kevin Crossley Holland, from his excellent A book of very SHORT stories, part of the OUP’s highly recommended series of books: Short! Like all the stories in the collection, it is short enough to read more than once in a single lesson and – importantly – it is the sort of length of story which children themselves might write. The situation it describes and the way the narrative unfolds is familiar enough, but also surreal enough, to grab the children’s interest and imagination, and it offers some challenging ideas to explore. 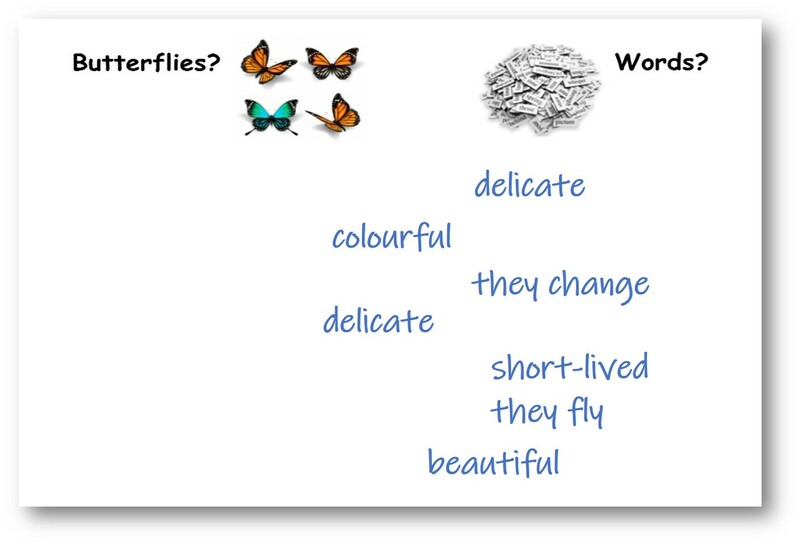 As pupils settled, they were encouraged to look at this slide on the IWB. 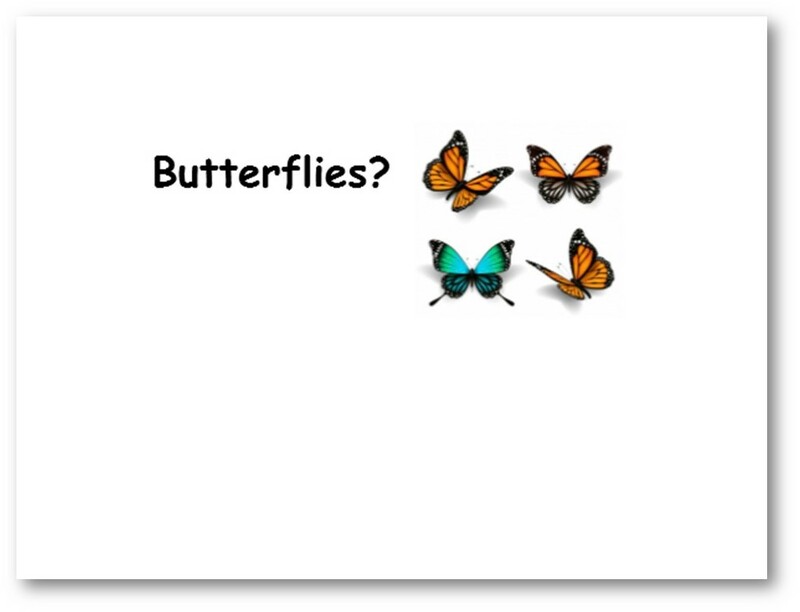 What do butterflies make them think about, or feel? 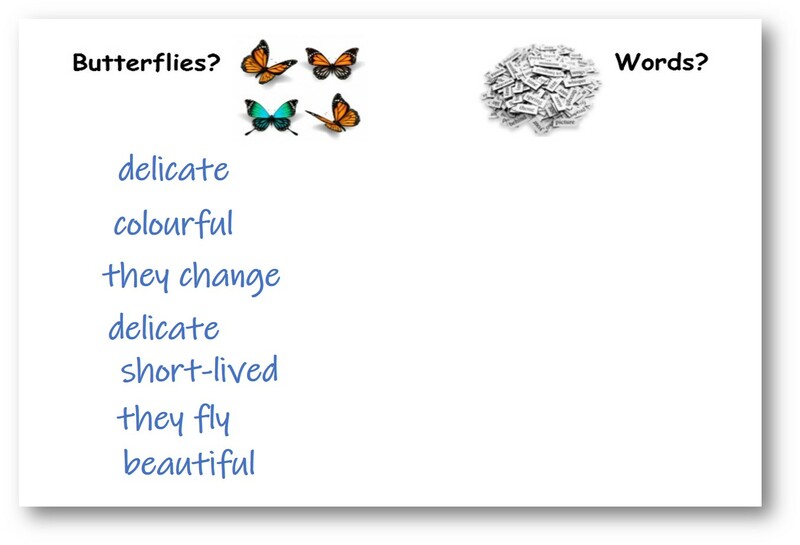 Formally starting the lesson, we thought of some “things about butterflies” which were written on the board. At this point, there was no discussion – just a rapid fielding of ideas. Next, we talked about whether any of these “things” could apply to words, as well. I led a discussion of one together, then the pupils talked in pairs about whether the others might. We then discussed the others on the board, moving them across if they could, or sort of could… Yes, words can be delicate. How? Hmm. Because they sound delicate – like the word “delicate” does. Any other examples? “Crackle”. Okay, how else might they be delicate? Can words break? We have to use them carefully. Ah, that’s interesting. What do you mean? And so on. Words can fly. What do you mean? They go from people’s mouths across to other people. That doesn’t sound like how a butterfly moves – it sounds too straight-liney – too direct. Sometimes we hear words floating across from somewhere. Ah, okay. Is that like a butterfly, though? Yes! They flutter about a room. OK. Have you heard the expression “Words flew”? Yes. What do you think that means…? And so on. This discussion could have gone on and on, encompassing a whole range of ideas about language and how we use it, and how we describe it. I cut it a bit short, in order to get on with the story. 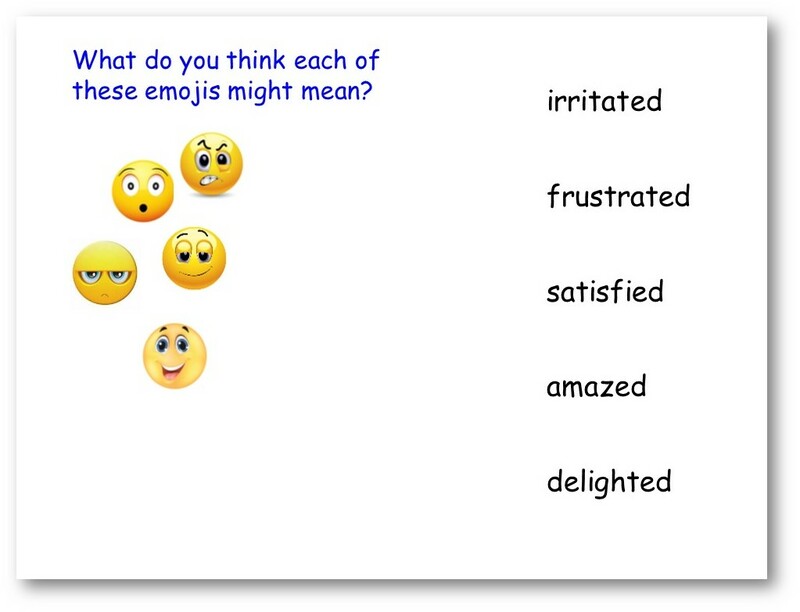 Next, I asked pupils to think about these five emotions, and we matched them to the emojis. 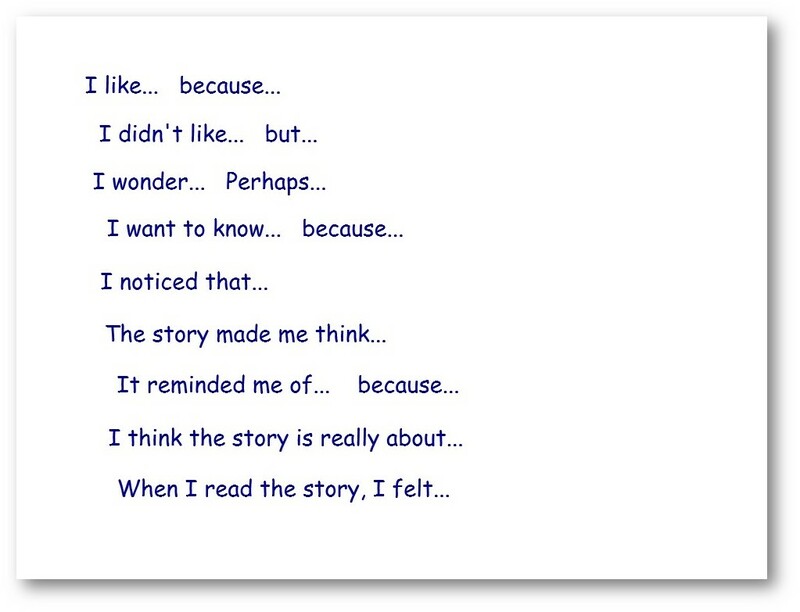 This involved some debate (‘frustrated’ and ‘’irritated’ caused some) but mainly involved children having to articulate what these feelings consisted of – how they could be defined, how they differed from each other, when we might feel each and so on. 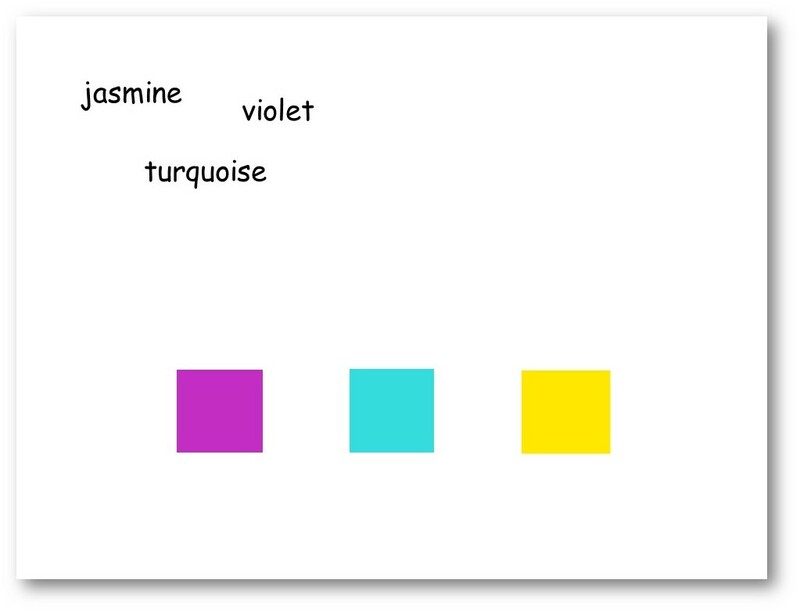 Before reading the story, I quickly established that all pupils knew the meaning of these three words, matching them to their colours on the board.All the pupils said the words aloud. 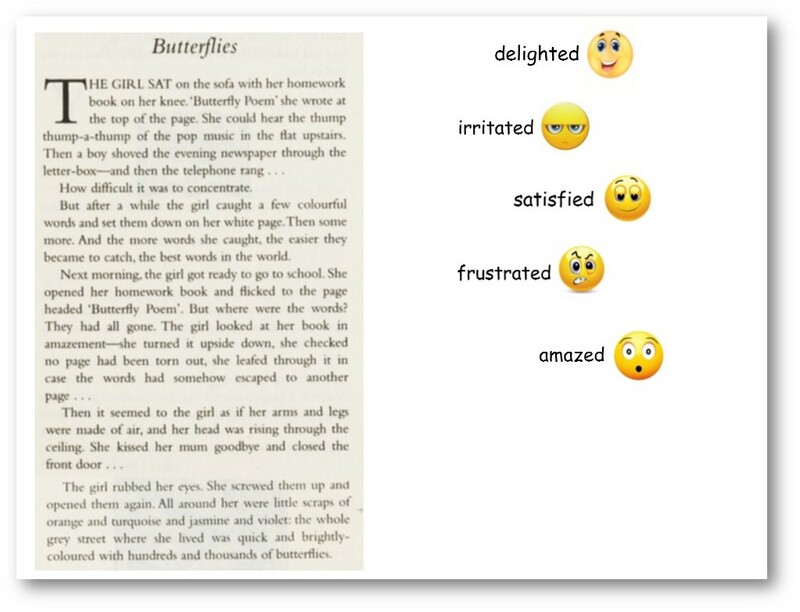 I then read it to the pupils, with them listening – eyes closed – trying to imagine as clearly as possible what is happening, what the scenes look like and what the characters might be feeling. First reading is with no distractions – just listening. 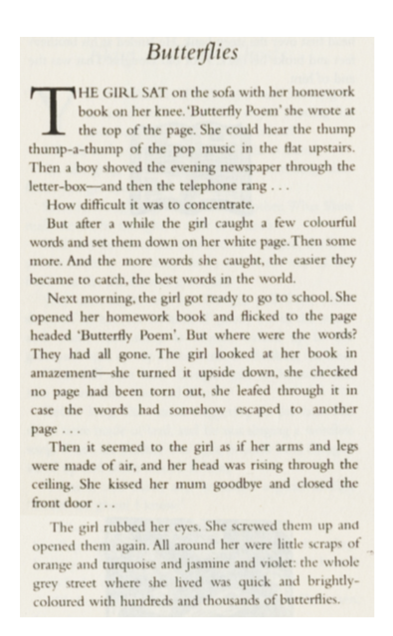 Next, I handed out copies of the story and read it aloud again, with pupils following in the text if they wished. This time, the instruction was to think of any questions they have about the story – anything puzzling or that interests them. 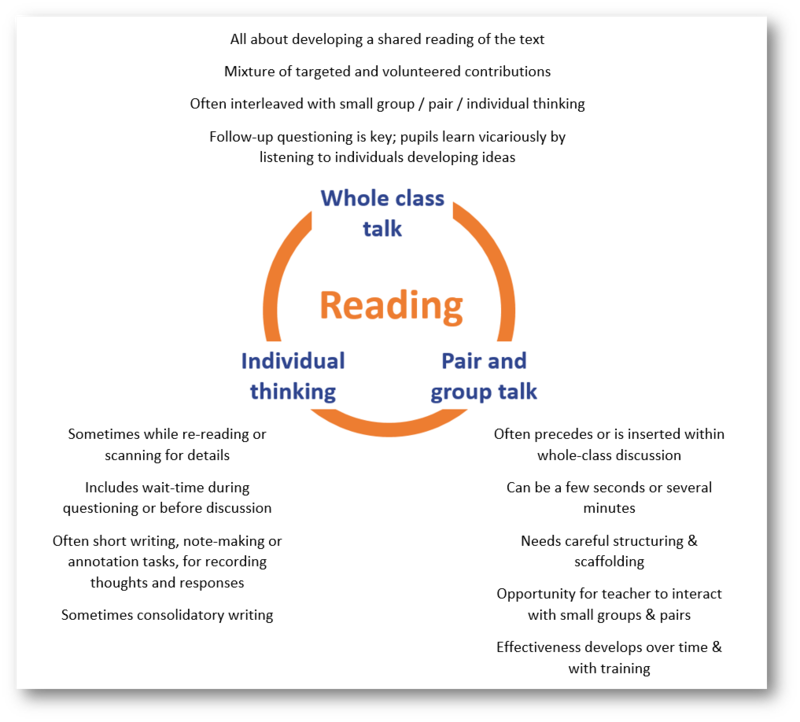 Pupils are not required to follow unless they choose to, avoiding possible sensory overload, but there is an ‘agenda’ for the second reading – in this case, thinking of the questions. I asked the pupils to imagine that the writer was about to appear in the room, and would answer any questions they had about the text. Silently all pupils now wrote down a question (or two or three if time) which they would like to ask him. They then shared these with each other in pairs and talked about what they thought the answers might be. I then led a discussion of some of these questions. 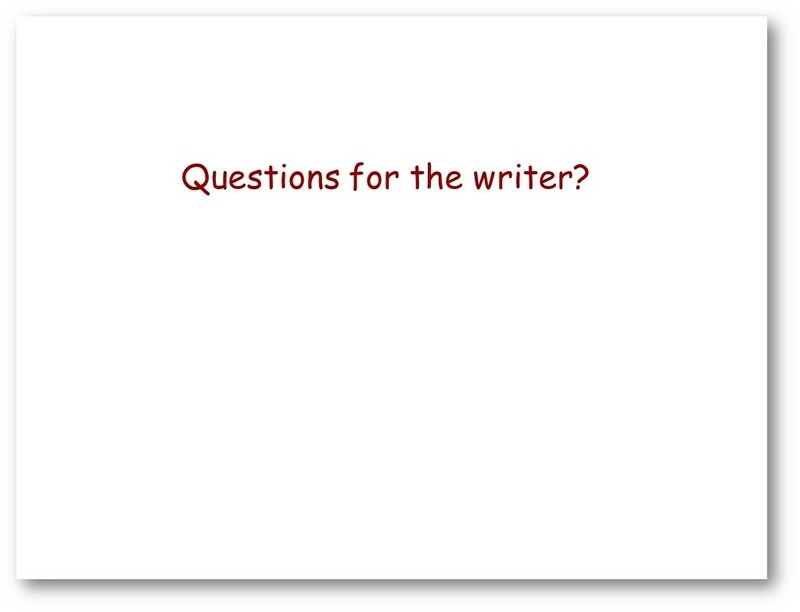 Some questions were about filling narrative gaps. What happened afterwards? What were the “best words in the world”? What do people think? Can we know for sure? Do we need to know, for the story to work? Some questions pertained to degrees of realism. Were the butterflies in the girl’s head or were they really there? Does this matter? Who thinks they were real? If they are not real, then what do they mean? What is the girl feeling? Do stories have to be realistic? Who liked the way it ended? Why? Why not? An autistic child asked the imagined writer in the room: Why are you being so rude to the girl? He explained that this was because the writer did not name her, referring to her only as “the girl”. This led to some interesting discussion. He also asked: Where is the girl’s father? We wondered why he isn’t mentioned, and whether this could be important, or not. 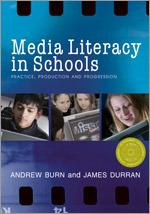 The possibility of rooting discussion of the text in these responses, letting them trigger or set the course of more ‘academic’ shared exploration – for example, of a writer’s intentions, of meanings or of the ‘effects’ of language. Michael Rosen writes of this technique as “making the text available for interpretation” and this is, of course, its real power. Like asking questions to characters, it foregrounds the uncertainties of reading – the maybes and the perhapses – the provisionality of meaning. It takes the impossibility of really knowing a writer’s ‘intentions’ and turns that into a strength. Next, we returned to the emojis. Together, we chose one and decided where on the text they might ‘pin’ it. We used the board to move the emoji and to annotate the text. A pupil suggested that ‘Frustrated’ could go with the first paragraph. I said that we needed more precision than that – we needed an exact place. Could she pin it to a particular word or phrase. The pupil suggested the word “thump”. Why? Because the sound is very irritating. Why do you say that? Because it’s not a nice word. So it’s just unpleasant – a negative word? It sounds really loud and like it would get into your head. So it invades your head? How would it have been different if the writer had written the word “beat” instead of “thump”? That wouldn’t really be so bad, because a beat could be quiet or gentle. So it’s a more neutral word? Does anything else about how the writer’s written it make the music sound irritating? He writes it three times – “thump thump-a-thump” – like it’s going on and on. So it’s about the repetition? Would anyone pin it to a different word? Yes, to “And then”. Why? It’s like more and more things are annoying her. If you had to pin it to just one single word, which would you choose? “And” or “then”. “And”, because it’s yet another thing – SO annoying! Like it’s piled on? I’d pin it to “shoved”. Why? Because it sounds annoying. But why? Because if you shove something it’s really hard. Show us what a shove looks like! OK, so what sort of word is it? It’s quite violent, really. OK, so what other word might the writer have used, which would have been different? ‘Put’, because that wouldn’t sound so rough. How did i describe a word like “put” earlier, when we were talking about “beat”? Neutral? Ah, OK. So “shove” sounds more negative. Any other words to describe it, apart from violent? Rough. OK, it’s more rough. Brutal! More brutal? Yes, like the boy doesn’t care. Because if you shove something it’s really hard. Then, pupils worked in pairs to pin the other emojis to the text. We then discussed each one as a class, again digging into the language and how the emotions in the text were being put across by the details the writer chose. The importance of modelling: the teacher leads the pupils through an example, before they work on their own or in pairs. As well as ensuring that pupils know what is expected, this is like pre-loading challenge, making sure that pupils are thinking more deeply as they work. Finally, pupils had some time to write freely about the story, using (or not using) these sentence stems as scaffolding. 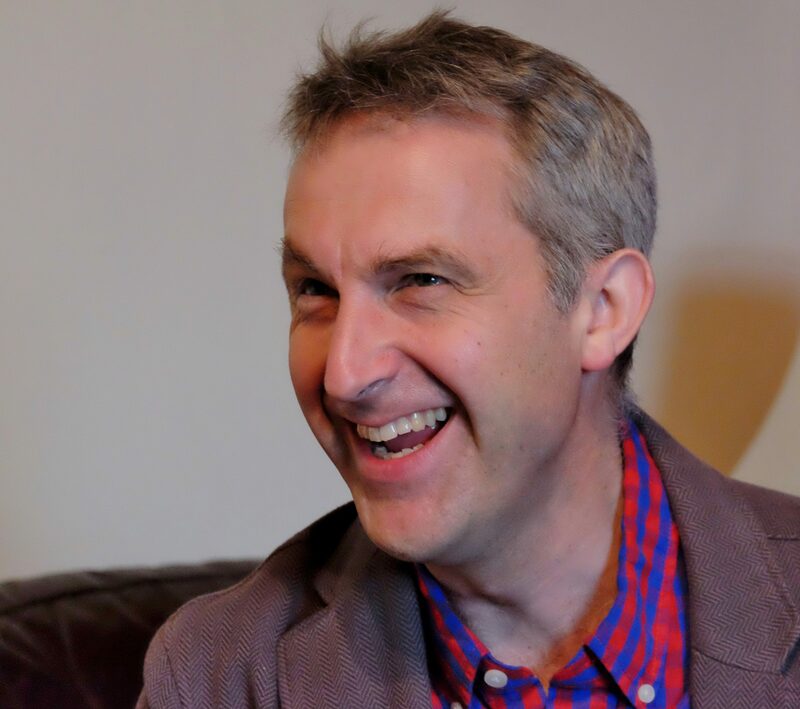 ‘Entering the intellectual and imaginative territory of the text’ – a brilliant blog James and what all literary study should involve at all levels.